An even bigger concern for InSight's seismometer—called the Seismic Experiment for Interior Structure (SEIS) - is temperature change, which can expand and contract metal springs and other parts inside the seismometer. 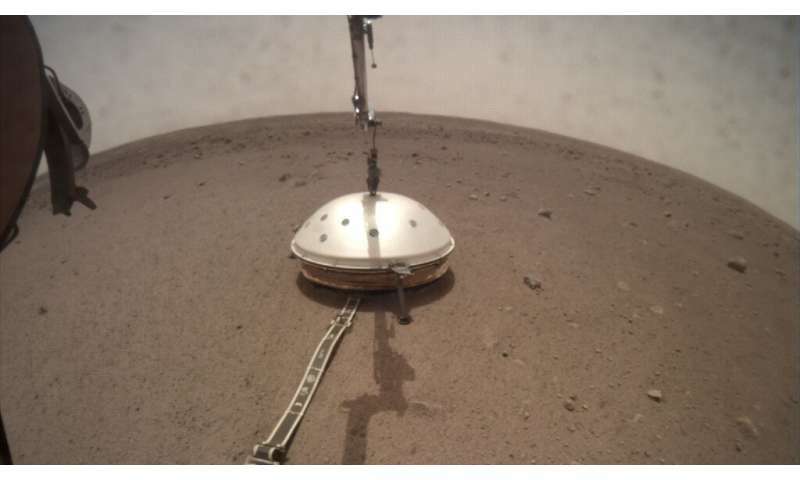 Where InSight landed, temperatures fluctuate by about 170 degrees Fahrenheit (94 degrees Celsius) over the course of a Martian day, or sol. But even that isn't quite enough. The sphere is enclosed within yet another insulating container—a copper-colored hexagonal box visible during SEIS's deployment. The walls of this box are honeycombed with cells that trap air and keep it from moving. Mars provides an excellent gas for this insulation: Its thin atmosphere is primarily composed of carbon dioxide, which at low pressure is especially slow to conduct heat. Would this instrument be sensitive enough ( sig/noise) to notice a 'smallish' impactor such as the one that made a 'pretty' crater recently spotted by MRO etc ? Or the one that hit the Moon during the recent lunar eclipse ?? Well, that's the easy part of instrument deployment completed. Now comes the hard part, deploying the Heat Flow probe, which is going to have to slowly pound its' way a couple of meters deep into the Martian soil. For some reason, I still have my doubts this can even work, but I'm looking forward to be proved wrong!